Halloween Tour: Old Chicago will feature a Halloween Beer Tour during the month of October. Eight Halloween themed beers will be on tap. Old Chicago Pizza & Taproom has been serving pizzas in its charming original building since the ’80s. It stands as one of the oldest in the franchise after the original spot on Pearl Street in Boulder closed last year. October stands to be a good month for the franchise. They will feature a Halloween Beer Tour with eight Halloween themed beers with two of those beers specifically on tap at Old Chicago locations only. Darklands by Ratio Beerworks, a dry-hopped dark lager, with notes of cocoa bean and dark toasted malt will be one of those on tap throughout the month of October. Two Topping Pizzas: $5 pub pizzas are served all day. Also, Tommyknockers Imperial Nut Brown will have a draft exclusive. Commemorating the 10th anniversary of Tommyknocker Brewery, this special brew is meticulously crafted with pure maple syrup, the highest quality chocolate and crystal malts and is accented with the finest blend of European and American hops. At this Old Chicago location, there are always 36 beers on tap with nine rotating all of the time. They are changed frequently as they like to keep it fresh and moving and introduce people to new beers. 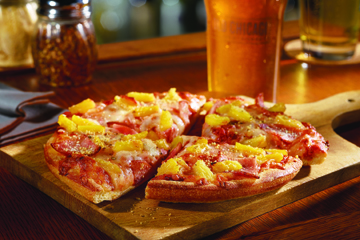 New styles, breweries, and trends appear all of the time and Old Chicago has the pulse of what their guests will enjoy. In addition to serving pizzas, pasta, burgers, wings, other menu items and beer, Old Chicago has a philanthropic arm of the franchise. In 2000, The CraftWorks Foundation was founded to provide a way to channel the corporation’s abundant giving, encourage and facilitate community service programs, and assist employees through unanticipated hardships. The CraftWorks Foundation continues to grow and seeks to make a difference in the lives of their teammates and their local communities. This dual commitment to their team members and communities is an integral part of the culture, setting them uniquely apart in the industry. “One of our core values is people,” said Poffel. “It’s not just the people outside the four walls but inside the four walls. The foundation also helps organizations outside the building.” Cory Elementary located up the street from Old Chicago was a recent beneficiary of their charitable efforts. The school held their first Dine Out of the 2018-2019 school year at Old Chicago on September 24, 2018, and Old Chicago, through The CraftWorks Foundation, donated 15% of each ticket back to the school. One fact about the menu that seems to fly below the radar is their $5 pub pizzas served all day. After 10 p.m., one topping pub pizzas are $2. This makes Old Chicago Pizza & Taproom not only a gem in the neighborhood, but an affordable place to take the entire family. 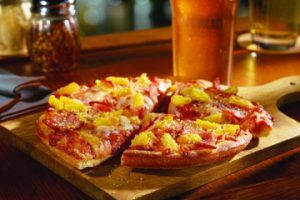 For more on Old Chicago Pizza & Taproom, visit www.oldchicago.com/locations/denver-colorado-blvd. They are open 11 a.m. to 2 a.m. every day. Reservations can be made by visiting Open Table or by calling 303-753-0824.